4 Days 3 Nights in Fun Filled GOA .Enjoy beautiful beaches scenic natural beauty, a thriving nightlife, laidback ambience and a magical charm ONLY WITH OUR GOA OFFER! The Golden Triangle tour is a private tour & can be started any time of year / month. The car, guides will be exclusively for you only. The tour is based on private departures, whereby you can benefit from having a private air-conditioned car, stop en-route for breaks or photo opportunities. Welcome to India!On arrival meet and greet by our representative and you will be transferred to hotel. Rest of the day at leisure Over night at Hotel. After breakfast from hotel move out for a full day sightseeing tour of the city that includes visiting to the Red Fort, Chandni Chowk & Jama Masjid along with other attractions. Evening free to move around the colourful markets for shopping. Over night at Hotel. Morning you will be proceed to Agra and check in at your hotel. After lunch visit the incomparable Taj Mahal and Agra Fort in a guided sightseeing tour. Rest of the day at leisure. Over night at Hotel. Early in the morning you will be transferred to the charming Pink City of India. On arrival check in at your hotel. In the evening take a walking tour of the colorful streets and bazaars of Jaipur City. The beauty of Jaipur is that its unique architecture and town planning is visible at even the most common places such as its squares and lanes. Over night at Hotel. Take a full day long sightseeing tour of Jaipur city that includes the City Palace, Jantar Mantar observatory, Hawa Mahal, Birla temple, Albert hall and excursion to the old capital Amber. Here at Amber, you'll ascend till the gates of majestic fort on elephant back. The fort displays a beautiful mix of Mughal and Rajput styles of architecture. Optional trip to ethnic village resort where you may enjoy traditional Rajasthani dinner. Over night at Hotel. Morning drive to Jodhpur. On arrival check in at your hotel and later visit to the magnificent Mehrangarh Fort (that reflects the city's glorious and troubled past), Jaswant Thada (the cenotaphs of the former rulers of Marwar) and Mandore (the ancient capital of the state of Marwar). Over night at Hotel. In the morning drive to Udaipur by your exclusive vehicle and check in at your hotel. Rest of the completely on your discretion. In the evening take a sightseeing tour of the breathtaking royal buildings around the Lake in boat tour. Over night at Hotel. Take a full day sightseeing trip of the city which includes visit to the City Palace (note the trees growing at the top floor of the palace, which is actually the summit of the hill the palace is covering! ), Saheliyon ki bari and excursion to temples of Nagada and Eklingji. In the evening you may visit the Shilpgram or can explore the interesting labyrinths around Jagdish temple at your discretion. Over night at Hotel. After leisurely breakfast drive to Pushkar, Pushkar boasts temples, though few are as ancient as you might expect at such an important pilgrimage site, since many were deserted by Aurangzeb and subsequently rebuilt. The most famous is the Brahma Temple, said to be one of the few temples in the world dedicated to this deity. It's marked by red spire, and over the entrance gateway is the Hans, or goose symbol, of Brahma, who is said to have personally chosen Pushkar as its site. Camel Ride at Pushkar. Over night at Hotel. Morning Drive to New Delhi at appropriate time your will be transferred to the international airport of New Delhi to board the flight back to home the tour ends. 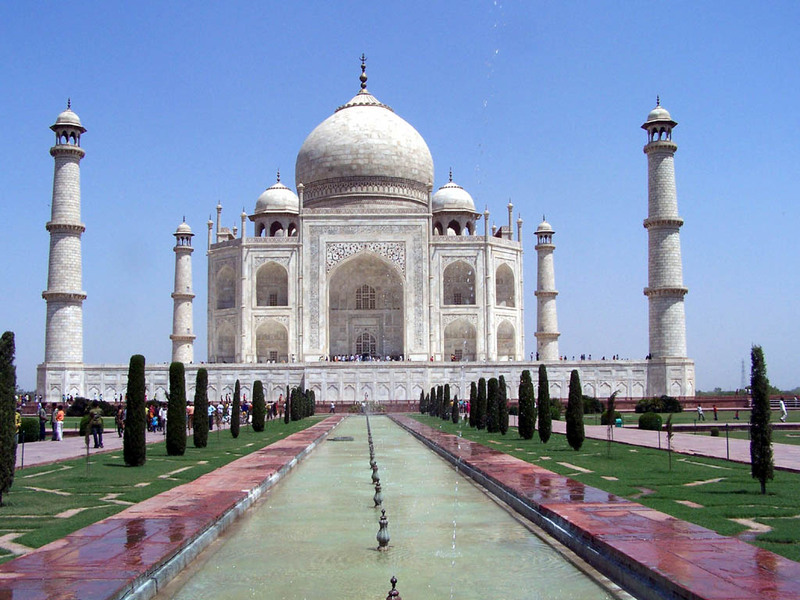 The Taj Mahal was built by the Mughal Emperor Shah Jahan to honor Mumtaz Mahal, his third wife. She died while bearing their fourteenth child, and Shah Jahan never really recovered from the loss. Construction of the mausoleum was completed around 1648. The Taj Mahal is one of the most beautiful buildings in the world, combining architectural elements from across the Muslim lands. Shah Jahan was a member of the Mughal Dynasty, descended from Timur (Tamerlane), which ruled India from 1526 to 1858. The name Taj Mahal may come from the Persian for "The greatest palace," or it may be a variant of Mumtaz Mahal's name. Literally, her name meant "the greatest," or "the chosen one." The holy city of Pushkar is located in the Ajmer district of Rajasthan, India. Pushkar is one of the five sacred dhams or pilgrimage sites for devout Hindus. One of the oldest cities of India. Pushkar lies on the shore of the sacred Pushkar Lake. The sacred waters of the Pushkar lake are considered at par with the waters of the Mansarovar lake situated on way to Mount Kailash the abode of Shiva. The date of actual origin of Pushkar is unknown, but legend associates Lord Brahma with its creation. Pushkar is also referred to as "Tirtha- Guru" - the Guru of pilgrimage sites or “Tirtha-Raj “ the king of all pilgrimage sites. Pushkar clearly qualifies for this title as it meets all criteria of the 4 categories of Hindu pilgrimages, “ The Deva –Tirtha”, “Asura-Tirtha”, “Arsha Tirtha” and “Manushya-Tirtha” It is said that Brahma performed penance here for 60,000 years Pushkar has many temples. Most of the temples are not very old, since many were destroyed during Muslim conquests of the area. Many of these destroyed temples were re-built. The most famous among all is the Brahma Temple. Today Just a few temples dedicated to Lord Brahma exist . Temples dedicated to Brahma are also located, Bithoor in Uttar Pradesh , Asotra near Balotra in Barmer district of Rajasthan , Besakih in Bali and Prambanan in Indonesia. The Pushkar lake has 52 ghats where pilgrims descend to the lake to bathe in the sacred waters. Adventure awaits you. You will never have felt so alive. Come to Australia and invigorate your body and soul with the 6 Nights / 7 Days tour.